We made a profit [of approximately $158 dollars]. The pulpit announcement generated sell-out sales from the 15 take-out dinners sold on Sunday and bailed us out! Great job cooking & selling crew for putting this together! Please write down your observations and lessons-learned so that we can improve on this event for next year. On Saturday night a few people asked if we had take-out dinners to sell that night. This certainly merits future consideration. We need volunteers for the Mathew Kelly, “Rediscover Catholicism – a Spiritual Guide to Living with Passion & Purpose” book distribution. I would suggest a table in the Commons for Palm Sunday Masses and Easter and, if we can, also have a table in MPH lobby for 9 and 11 on Easter. I will help as able. Someone has mentioned putting some type of K of C sticker inside the front cover of the books (John V is working on labels). If we have such a thing or someone can make them, I’d be happy to meet at Church this Saturday morning after Mass and Rosary to affix the stickers…if we have enough people, 9-10 a.m. would probably do it. Please put out the request to the Brothers and let me know what you think. Thanks. VATICAN CITY, March 13, 2013 (Zenit.org) – Cardinal Jorge Bergoglio is already well known for his simplicity: for being a pastor among the people, a cardinal who takes the bus and cooks for himself, for example, and a great defender of the poor. Now as Pope, he has begun with simplicity. “To pray the simplest prayers with the people is the greatest sign of simplicity,” observed his fellow Jesuit, Father Federico Lombardi, director of the Vatican press office, in reference to Pope Francis’ leading the people in the Our Father, Hail Mary and Glory Be during his first appearance on St. Peter’s central balcony. Fr. Lombardi acknowledged his surprise at the election, and declared this is a “moment of joy for the Church.” He went on to speak of Cardinal Bergoglio-Pope Francis’ style of “evangelical testimony” and stressed his humility, evidenced in how he bowed down before the people, asking them to pray for God’s blessing upon him, prior to giving his first apostolic blessing as the Successor of St. Peter. Fr. Lombardi also noted his pastoral style, immediately applied to his new diocese, the Diocese of Rome. The Vatican spokesman said it was an act of courage for the cardinals to “go across the ocean and choose a Pope.” Pope Francis is the first pope from the Americas. In fact, he was immediately acclaimed as a pope of many firsts: the first Jesuit pope, the first pope of the Americas, and also the first to choose the name Francis. 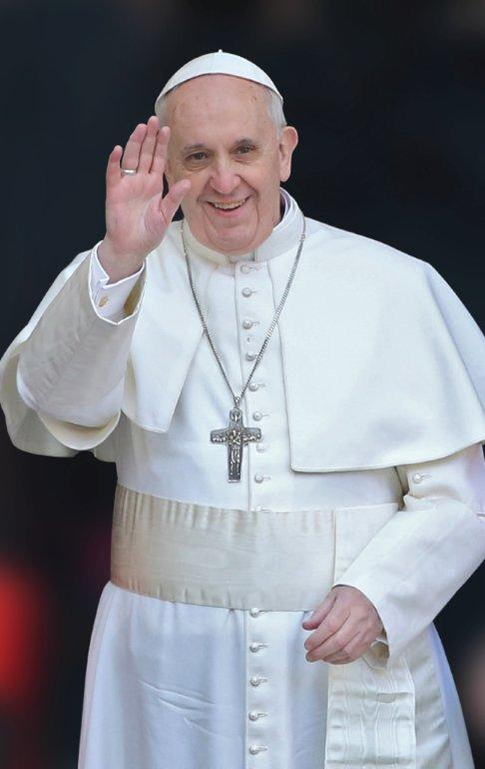 Father Thomas Rosica of Canada’s Salt and Light Television, who has been assisting Father Lombardi during the time of the interregnum, spoke of his choosing the name Francis as a sign of humility. From SBCC Men’s Ministry Group: Father Leo will be here March 21-23. Here is a YouTube clip of him and information on the retreat. It is an awesome way to really prepare for Easter, and include our families in it with us. What is a Parish Mission? A parish mission is a parish wide event in which an invited speaker gives a series of talks on a theme over multiple evenings. The talks are intended to help us grow in our faith lives while being entertained, challenged, and engaged. What will each evening be like? Each evening we will have one of the following liturgies/prayer experiences offered before the talk: Rosary, tations of the Cross, or Exposition of the Blessed Sacrament with Benediction. The last two of the nights of the Mission will have meals offered and Fr. Leo will offer two live cooking exhibitions during the course of the Mission. A full schedule of events is posted in the Gathering Space of the Church. It’s just about time to make your reservation. We have 2 new features! We have arranged for a private guided tour of St. Matthew’s Cathedral in Washington. This is the seat of the Archdiocese and not only plays a role in our Nation’s history, but is a most beautiful Cathedral. Trust me…you will be impressed. Second, the Knights of Columbus have opened the Blessed John Paul II Shrine with Saturday hours. Those of you who would like to visit the JPII Shrine will have that opportunity as well. Moreover, since certain of our destinations have been designated as official pilgrimage sites during this Year of Faith, and our schedule includes the opportunity for the other requisites, you will be able to gain a plenary indulgence by fully participating in this year’s Pilgrimage. Please spread the word. AND boy, do they have a deal for you! How would you like free, hands on, cooking lesson from a world renowned, Master Chef? In addition to this fabulous event, you will help out the Little Sisters of the Poor. Because of the popularity of this event, we will be extending the hours and need to prepare more food. Chef Paul would like to prepare each dish on a separate day. This FREE offer is limited time only so please let me know ASAP. PS: We will need help on the day of the Festival serving these wonderful delicacies. You can sign up for shifts at: http://www.rvafrenchfoodfestival.com/fff/ and sign up for Chef Paul's tent. Contact Gene. Please forward the above website to anyone you know who may be interested in volunteering to help out for the festival. Now, in an epic five-week, 10-hour television miniseries premiering March 3 on the History Channel, the Hollywood couple is bringing The Bible to life in a way the world has never seen before. In his youth, four-time Emmy Award winner Mark Burnett saw the Bible as an angry God’s strict rule book. But in time, Burnett, the producer of Survivor and The Celebrity Apprentice, and his wife, Touched by an Angel star Roma Downey, begin to understand the Scriptures as a love story. “We wanted it to be heartfelt and we wanted it ultimately to be a love story — to tell the Bible from the beginning to the end in a grand, sweeping embrace,” Downey, a celebrated Emmy Award and Golden Globe nominated television and stage actress, said during a recent webinar hosted by Outreach, Inc. The miniseries, which will air on Wednesday and Sunday nights on the History Channel and on Monday nights on Lifetime TV throughout the month of March, features the Bible’s most compelling stories beginning with the Book of Genesis and concluding with the Book of Revelation. “We wanted to tell this story in a way that would emotionally connect with the audience — that we could reach out and pull an audience in as if we’re walking side by side with these characters in the Bible,” Downey says. Thanks to the latest special effects and film-making techniques, the miniseries promises to bring Noah’s Flood, Moses parting the Red Sea and David killing Goliath to audiences in all their divine, cinematic glory. The miniseries comes as a dozen Bible-themed movies are set to hit the Big Screen over the next few years, including Mary Mother of Christ, a prequel to Mel Gibson’s The Passion of the Christ; Noah with Russell Crowe; Steven Spielberg’s Gods and Kings; Ridley Scott’s Moses; Scott Derrickson’s Goliath; Pontius Pilate with Brad Pitt; Left Behind with Nicolas Cage; and a remake of Ben-Hur. The Bible miniseries, a docudrama featuring the great Bible stories spanning thousands of years, is an apropos beginning to Hollywood’s Bible storytelling revival. The last time this happened was in the 1950s and 60s when director Cecil B. DeMille and others produced a deluge of Biblical films like The Ten Commandments with Charlton Heston and The Greatest Story Ever Told with Max von Sydow. To help insure the accuracy of the miniseries, many Christian scholars served as advisors and hundreds of Christian leaders have endorsed the miniseries. Scott Evans, founder and president of Outreach, Inc., the parent company of Outreach magazine, says his company is encouraging churches to use the miniseries as an evangelistic tool. The company is offering The Bible 30-Day Church Experience Campaign Kit and other resources churches can use to engage people. For more information, go to www.outreach.com/Bible. Downey says she and her husband, who co-wrote the novel A Story of God and All of Us to coincide with the release of the miniseries, have come to understand the Bible through the eyes of Jesus while making the miniseries. “One of our goals was to bring fresh, visual life into these stories that we are all so familiar with so you could see them in ways perhaps you hadn’t considered before with the intention that you will go back to Scriptures and back to your Bible,” Downey says. a three-and-a-half-year journey” for Burnett and Downey — was shot on location in Morocco from February through July of 2012. The 400-plus member crew consisted of people from the United Kingdom, South Africa, the United States and Morocco. Likewise, the miniseries features an international cast. Downey stars as Mother Mary, Portuguese TV star Diogo Morgado plays Jesus, The Iron Lady star David Rintoul is Noah, William Houston plays Moses, Exodus star Daniel Percival is John the Baptist, Conan the Barbarian star Nonso Anozie plays Samson and Invictus star Langley Kirkwood is cast in the role of David. It was humbling, Downey says, to play Mary. When it came to the role of Jesus, Downey says the crew became anxious because filming was about to begin, but Jesus hadn’t been cast yet. Suffice to say, God was “all over that and an absolutely perfect actor” appeared, Downey says. This message was sent using our send-to-friend service. Visit the Catholic Education Resource Center at http://www.catholiceducation.org. Troy Anderson. “The Bible: Series Premier.” tothesource (February 22, 2013). This article reprinted with permission from tothesource. Tothesource is a forum for integrating thinking and action within a moral framework that takes into account our contemporary situation. We will report the insights of cultural experts to the specific issues we face believing these sources will embolden people to greater faith and action. Troy Anderson is an award-winning government and enterprise reporter for the Los Angeles Daily News who also freelances for a variety of national and regional magazines, including Christianity Today and Charisma. During his 17-year career, he has worked as a staff writer at a variety of newspapers and won nearly two dozen national, state and local journalism awards. Anderson graduated from the University of Oregon in 1991 with a bachelor’s degree in news-editorial journalism and a minor in political science. He is a longtime member of Investigative Reporters & Editors. He lives with his wife and their 8-year-old daughter in Claremont, California and is active at Granite Creek Community Church. Below is an email regarding a Knights initiative to pray for the church during the transition within the Papacy. Please make an effort to support this worthy activity as described below. This email was sent to KELLYMORTENSEN@COMCAST.NET from info@KofC.org. Success with the St. Bridget Blood Drive March 3, 2013! Thanks to all who assisted in saving lives this weekend by donating to Virginia Blood Services. We don’t always get to see how our love, prayers and devotion to God touch the lives of others. And although it is somewhat anonymous, through the generosity of blood donation we can witness a very real and material way to touch the lives of those who need blood in order to survive surgery or some other tragic ordeal in their lives. Those who participate in this effort make a very real difference in the lives of others. Thanks to the Knight’s Council 5476 for helping to sponsor this event! Good morning!! Thank you all for the blood drive yesterday! We registered 17 people and brought back 18 units (one person gave a double – thanks John V!). The 18 units collected can help as many as 54 lives in central Virginia. Please let me know any feedback you may have for us.